Acquarella is a water-based nail polish making it non-toxic and the safest nail polish on the market. There are no harsh chemicals - and of course no DBP, toluene, or formaldehyde. 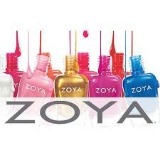 It is 80% water and the water actually soaks in to hydrate your nails plus there is no chemical odor! The best part? It looks great & they have a great selection of colors.